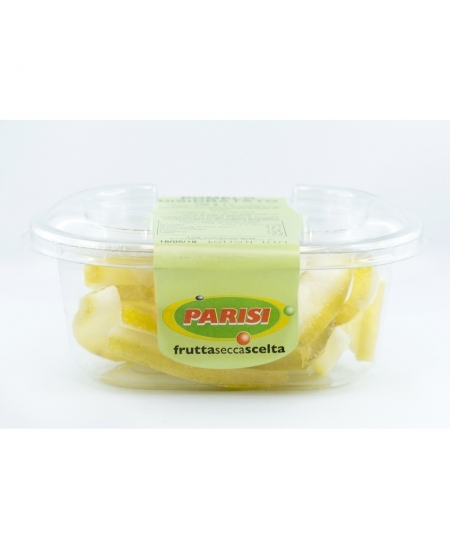 Home > Dried Fruit>Pomelo disidratato - 130 gr - Parisi s.p.a.
Pomelo disidratato - 130 gr - Parisi s.p.a.
Dehydrated and sugary consumed is an excellent fatty snack and a great source of calcium contributing to the normal function of digestive enzymes. This fruit is probably one of the three or four species from which all the fruits of the Citrus genus derive and is believed to be one of the ancestors of the grapefruit. Its scientific name is Citrus maxima and is native to Southeast Asia: from Malaysia, where it has been cultivated for thousands of years, it was imported into other countries. 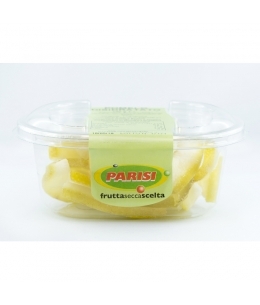 The pomelo is very goodly consumed to the natural, a medium fruit generally corresponds to at least four portions but is often used as an ingredient in salads or to accompany legumes. The peel also consumes in China, which can be cooked, stewed or braised, or candied.